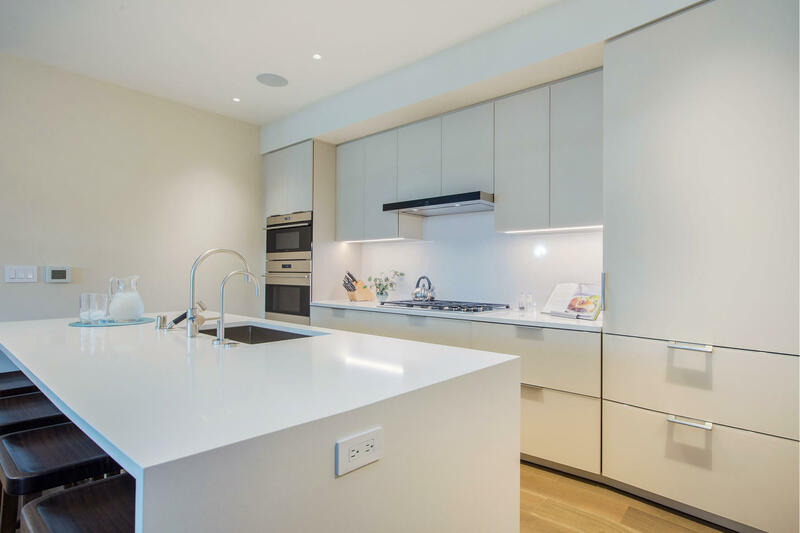 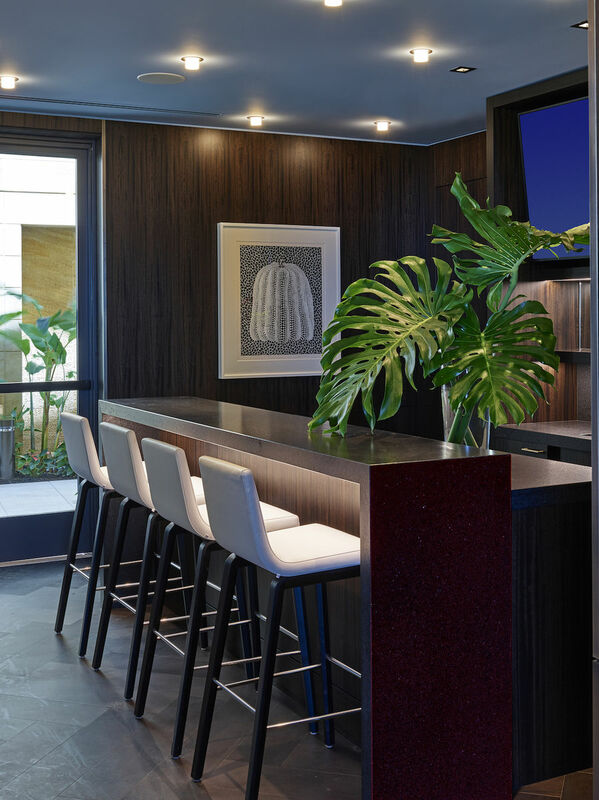 The Sunset suite is equipped with a full modern kitchen and dining area which comfortably accommodates six. 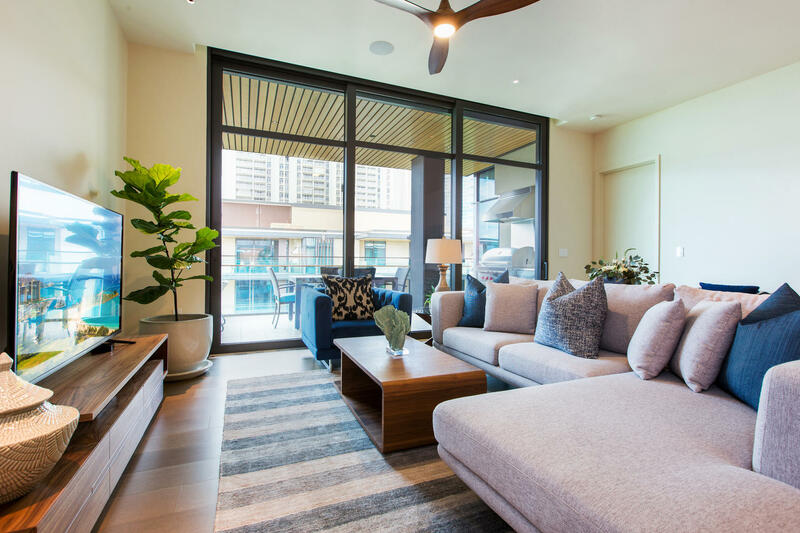 In the evening, lounge on the sofa for some television time. 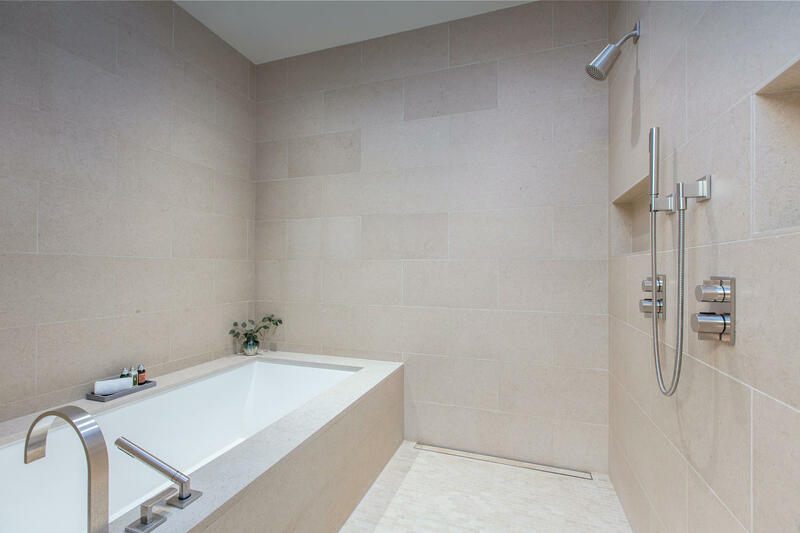 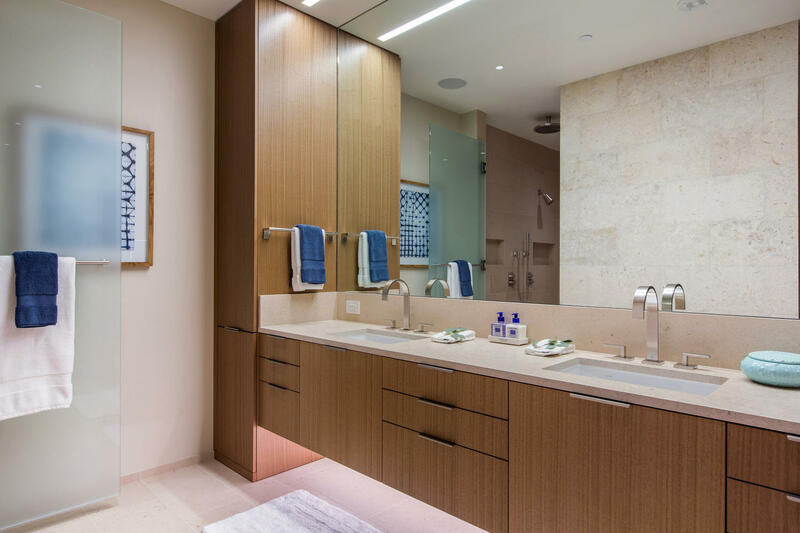 The master suite features a sumptuous king-size bed and spa-like ensuite bathroom complete with tub and walk-in shower. 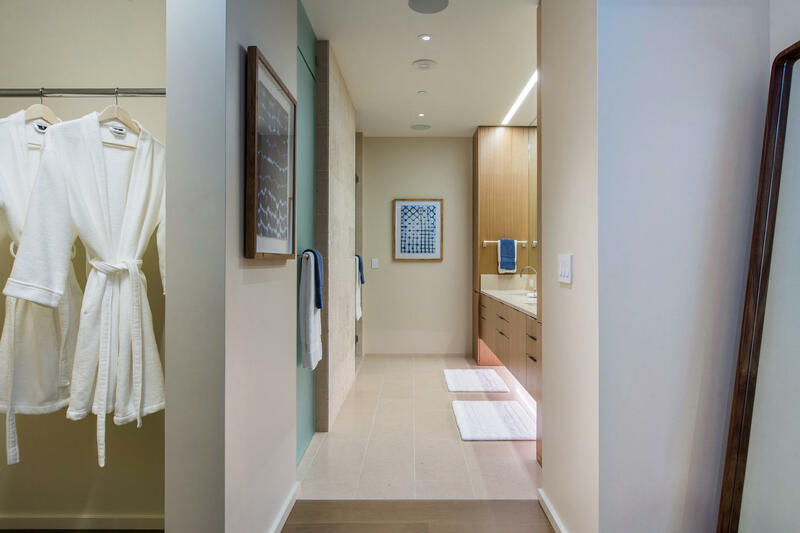 The guest suite includes a queen bed and access to the hallway bathroom, which offers a walk-in shower and high-end finishes. 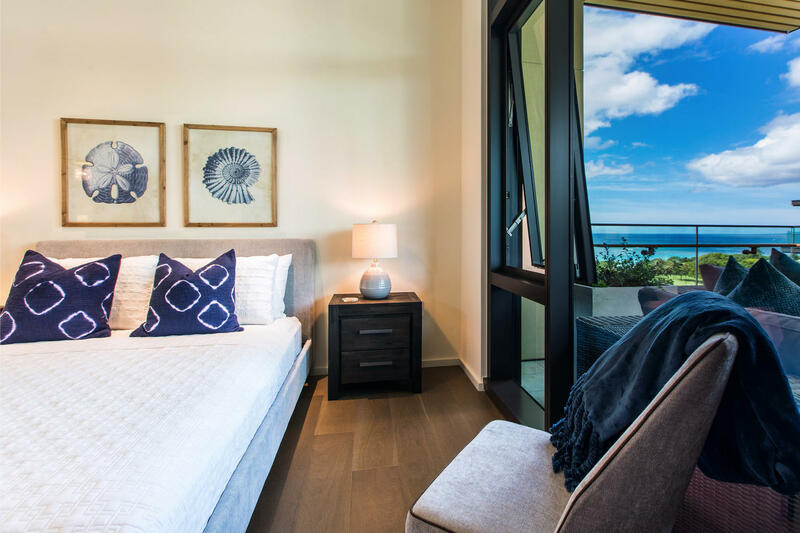 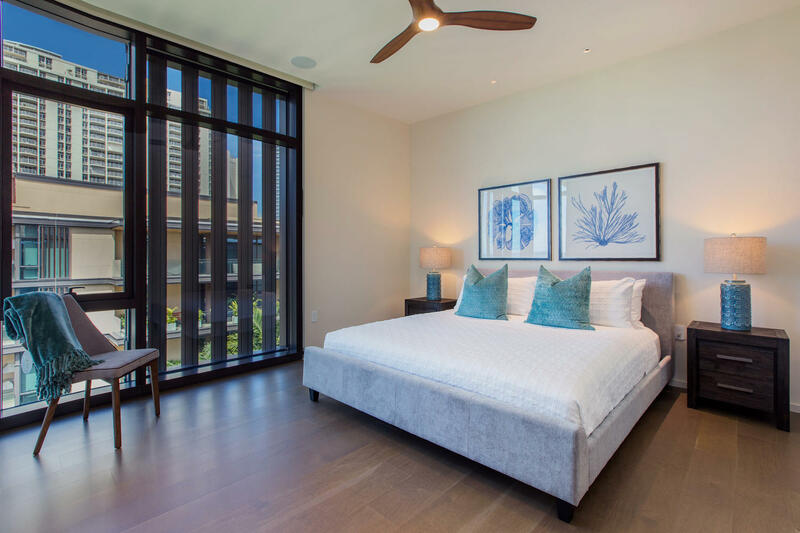 Both bedrooms boast spectacular ocean and garden views, walk-in closets, air conditioning, ceiling fans, and televisions. 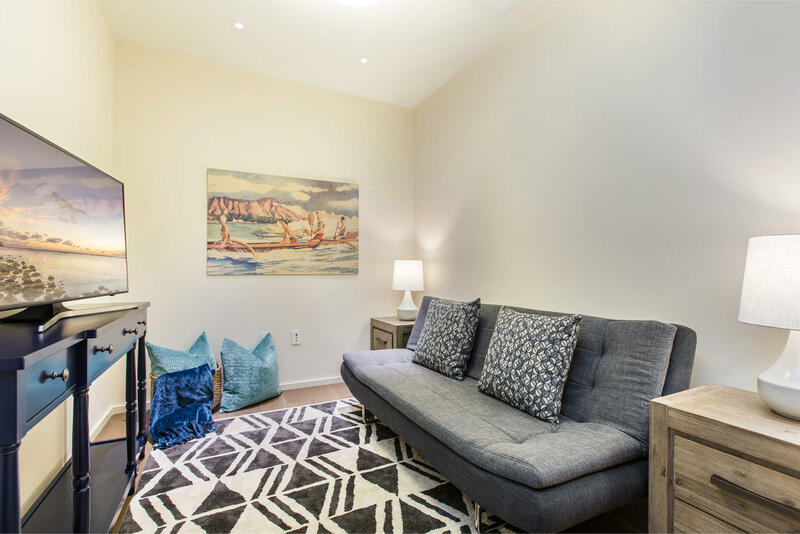 An additional den with a sleeper sofa provides a big screen television and a tranquil space for relaxing. 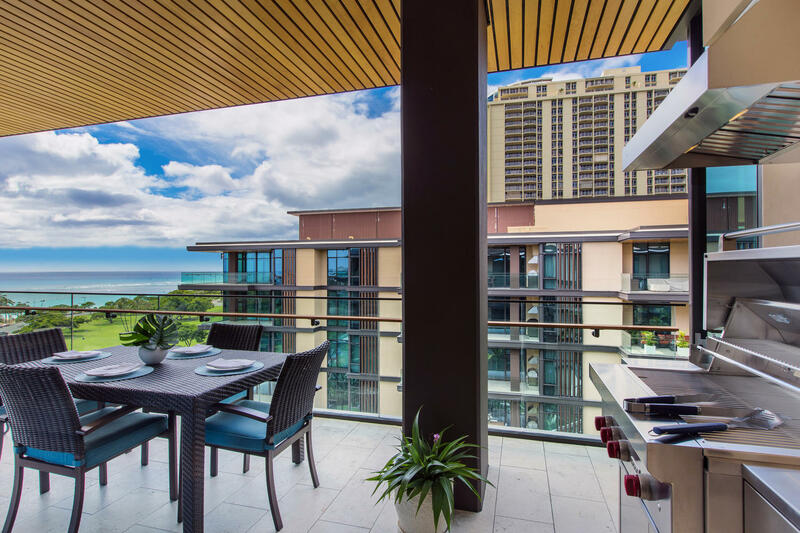 Located on the eighth floor, this suite boasts spectacular ocean views from the spacious lanai. 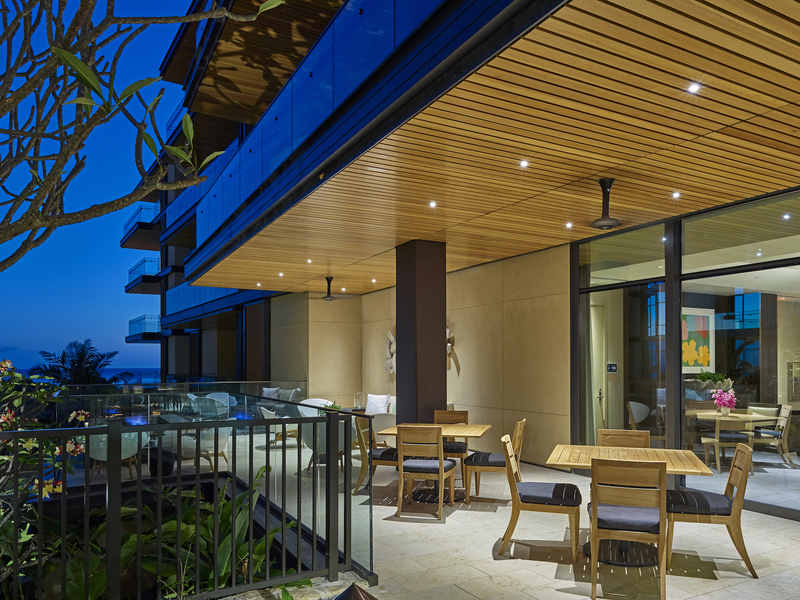 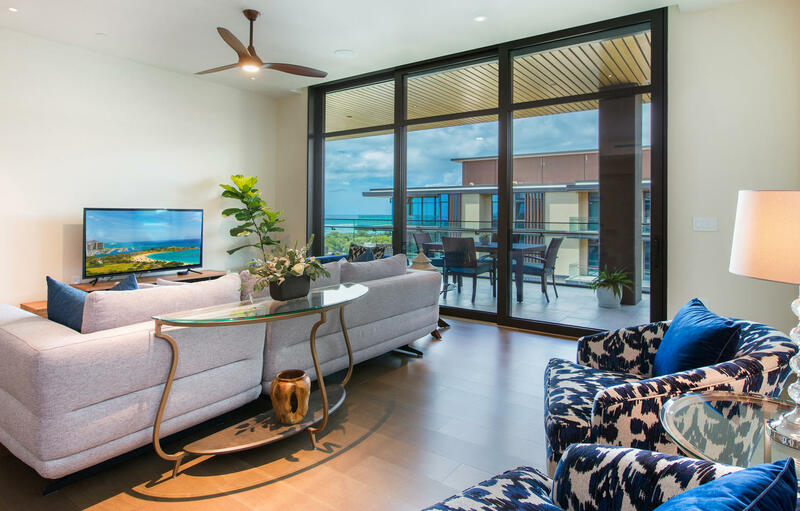 Sliding glass doors separate the lanai from the living room, allowing the ocean breeze to sweep through the home. 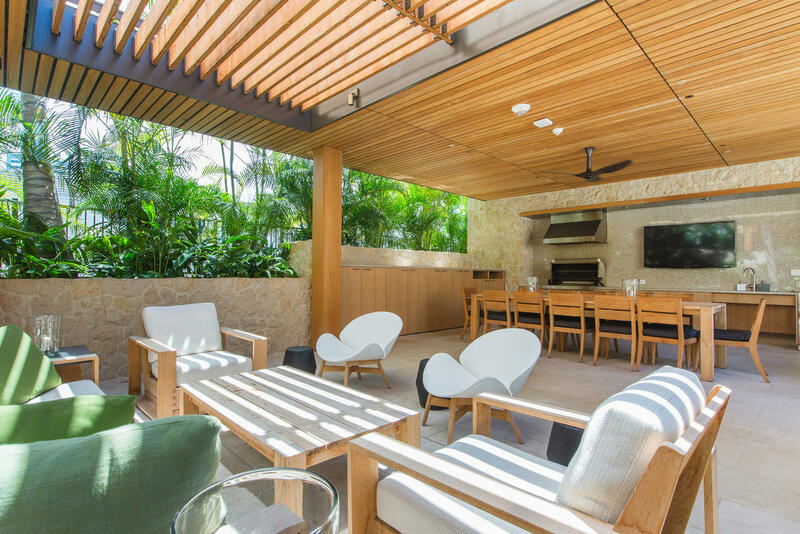 Barbecue at your grill after a fun-filled day, or enjoy cocktails as you take in the sunset. 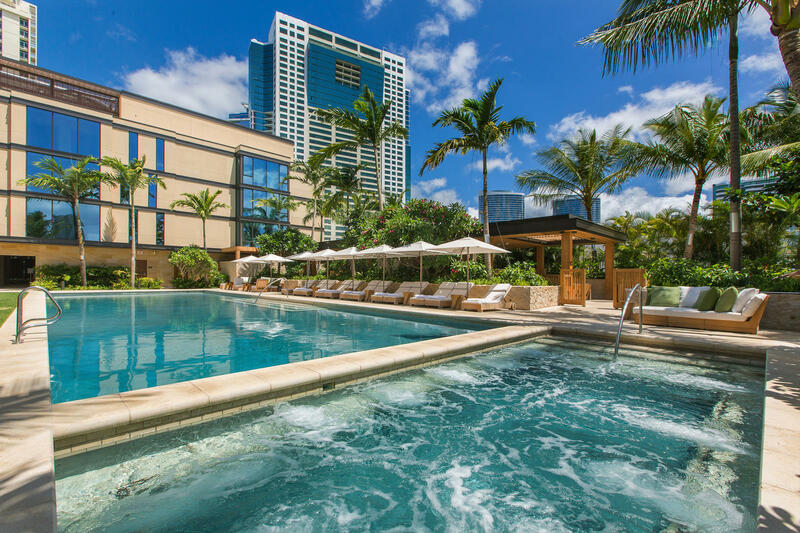 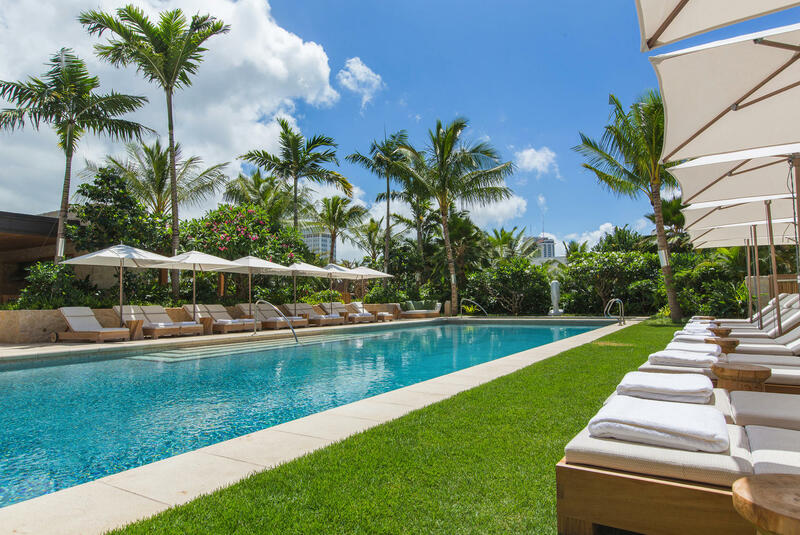 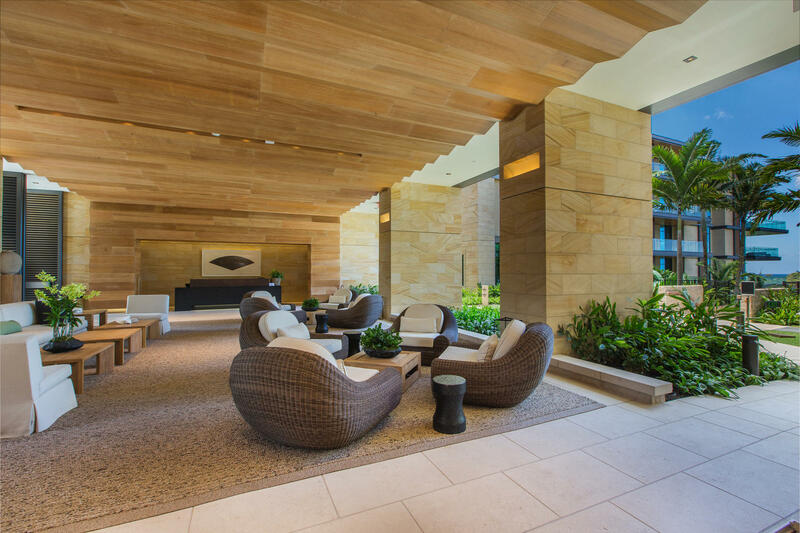 Outside of the Sunset suite, Park Lane provides a generous amount of resort-like amenities including an expansive outdoor barbecue with entertaining area, sun-drenched pool and hot tub, fitness center, spa, private dining areas, and 24-hour security. 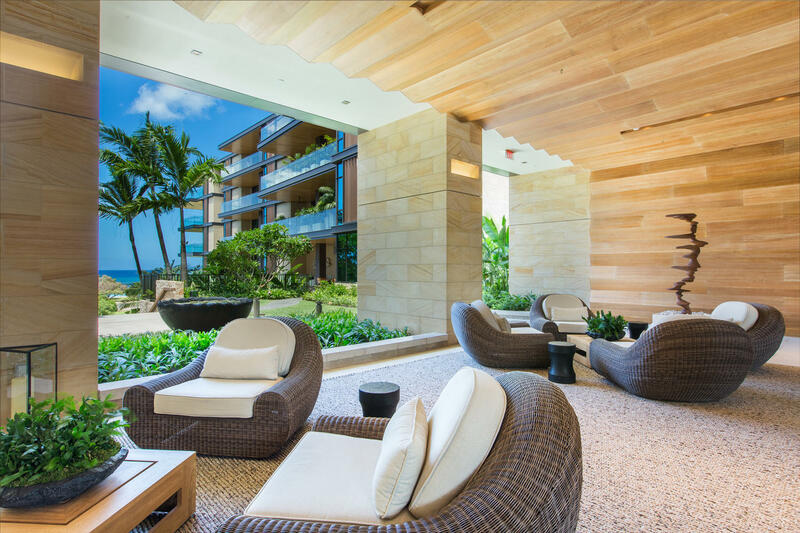 Concierge services are also on hand to make your dream Hawaii vacation come true. 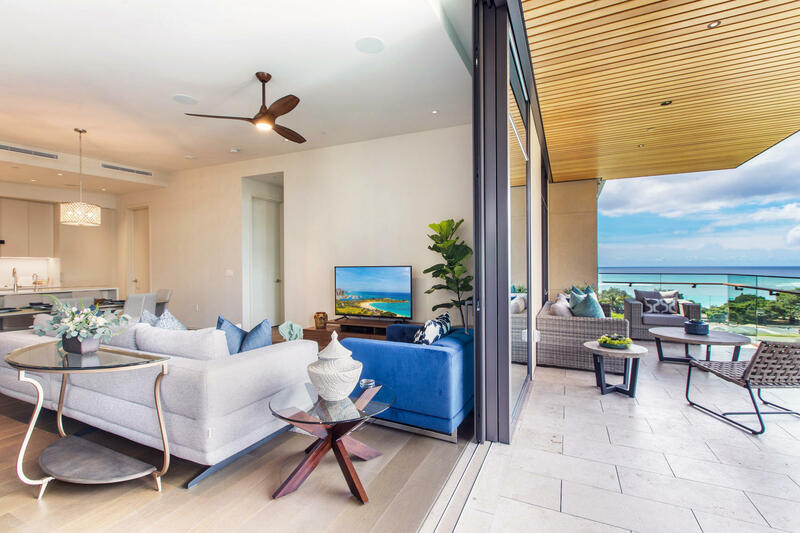 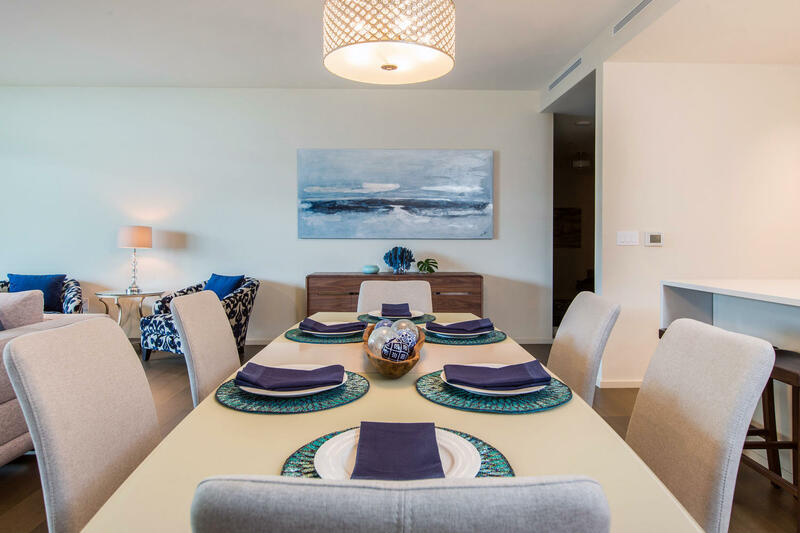 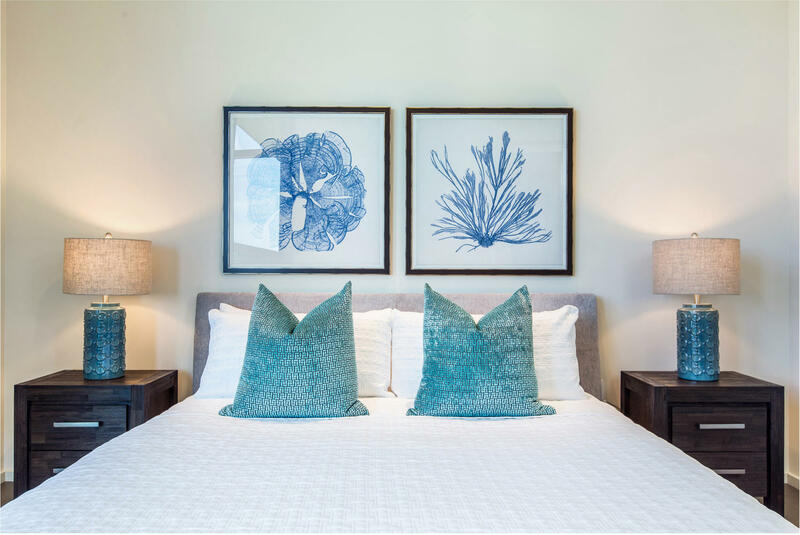 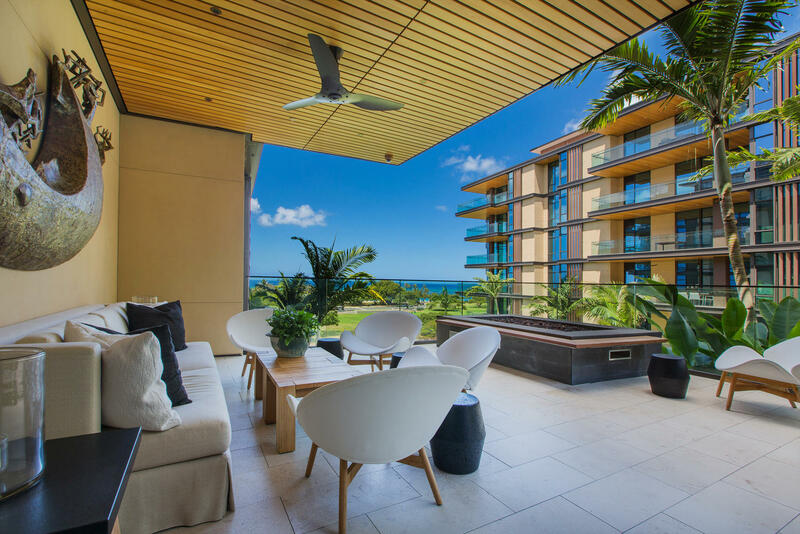 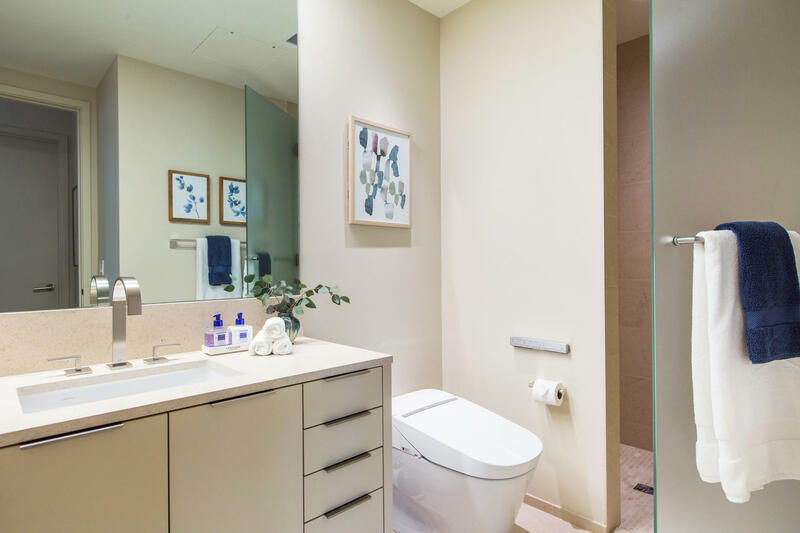 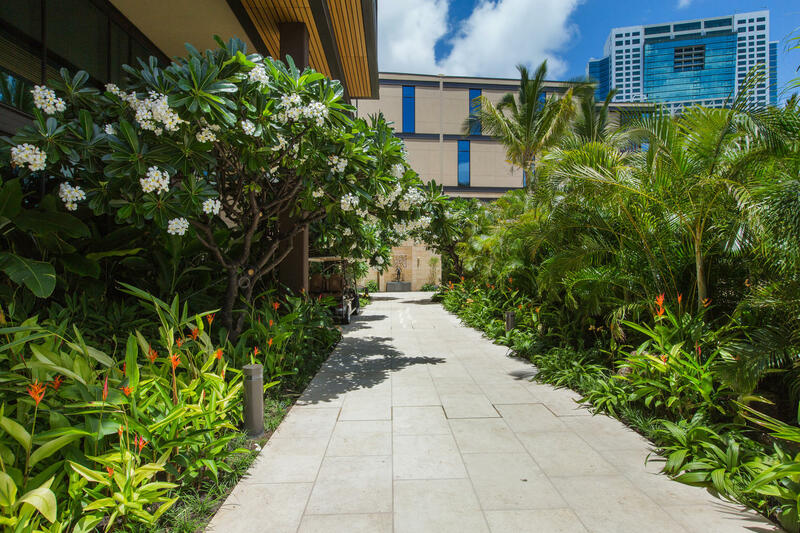 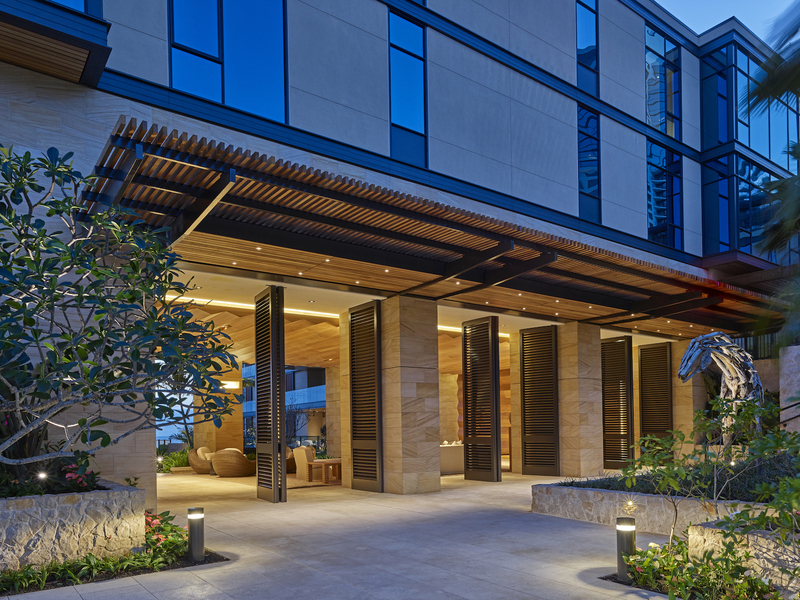 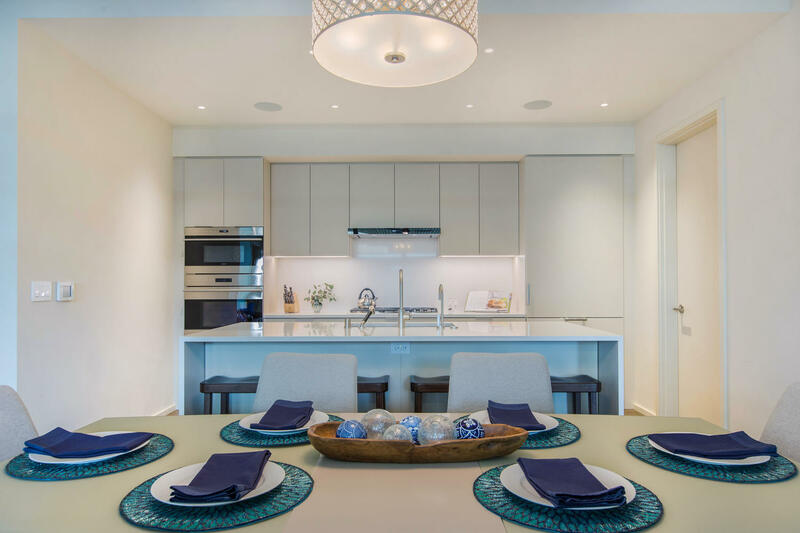 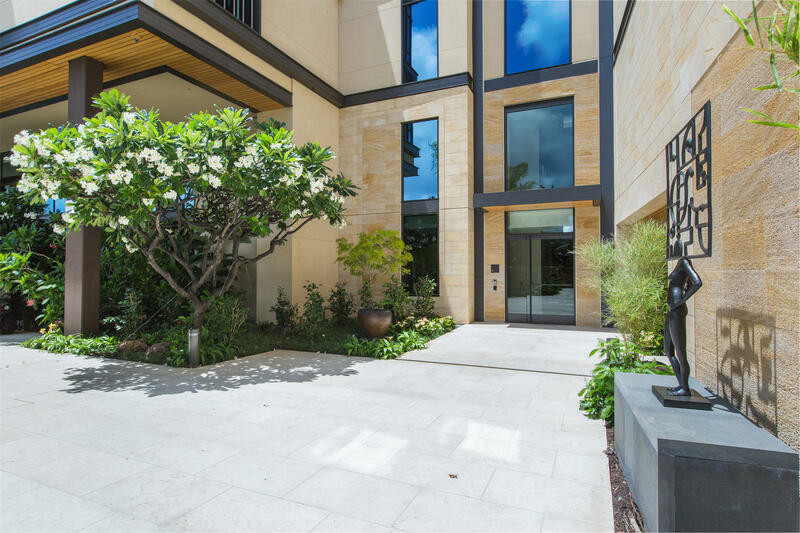 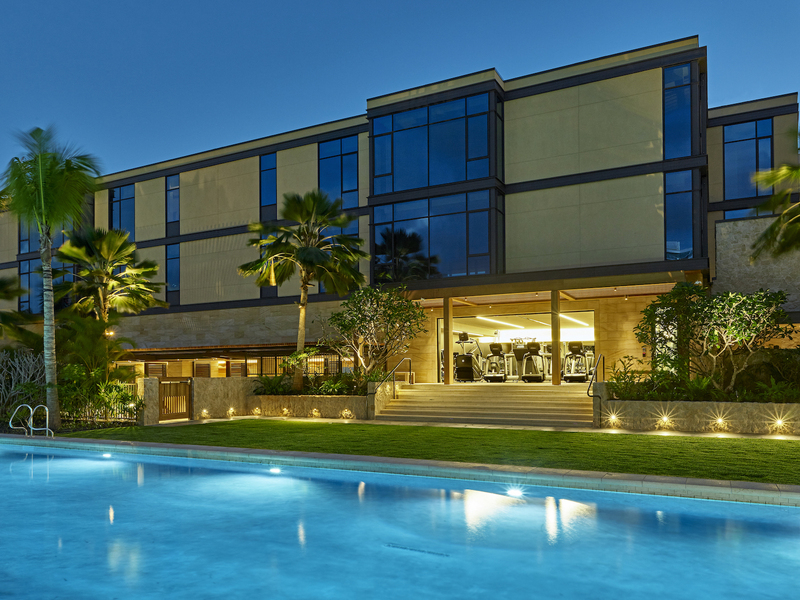 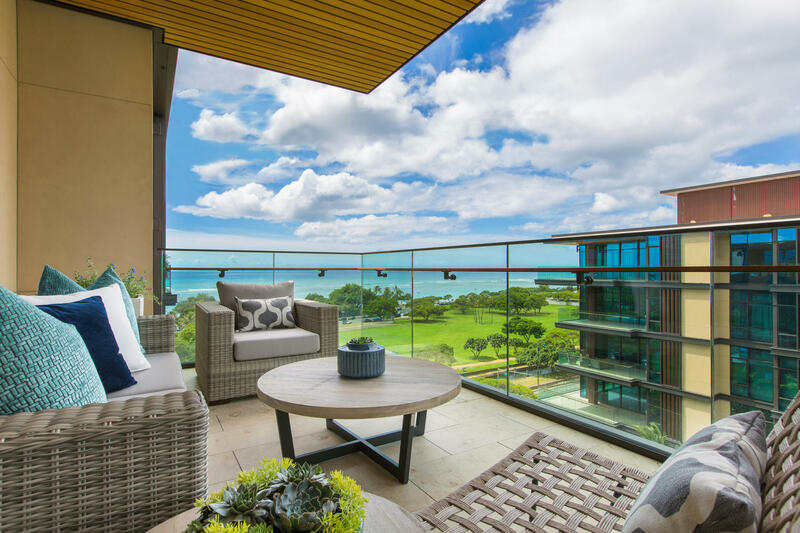 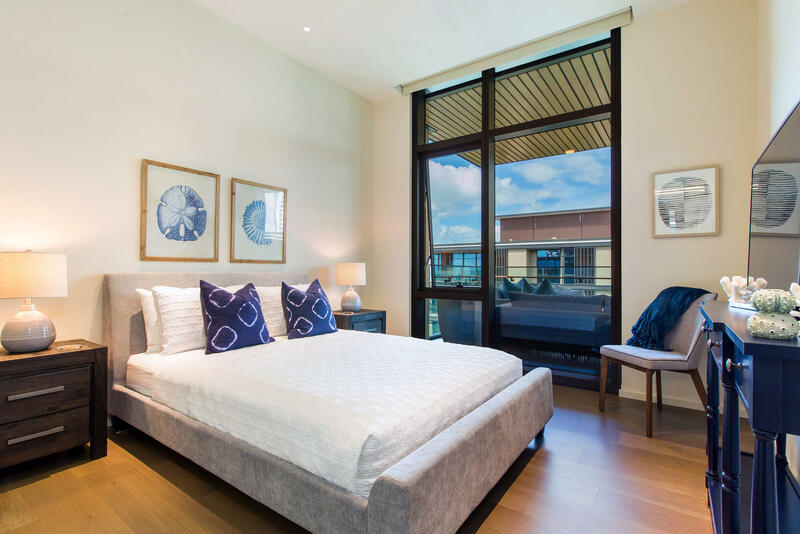 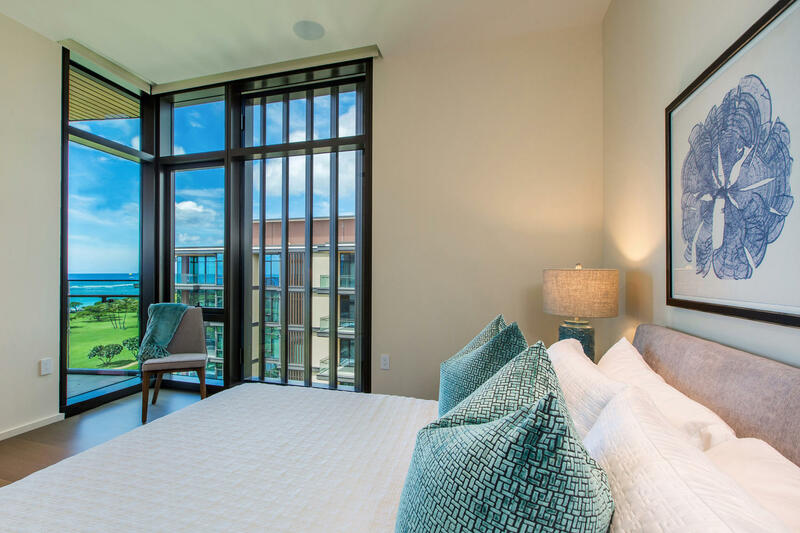 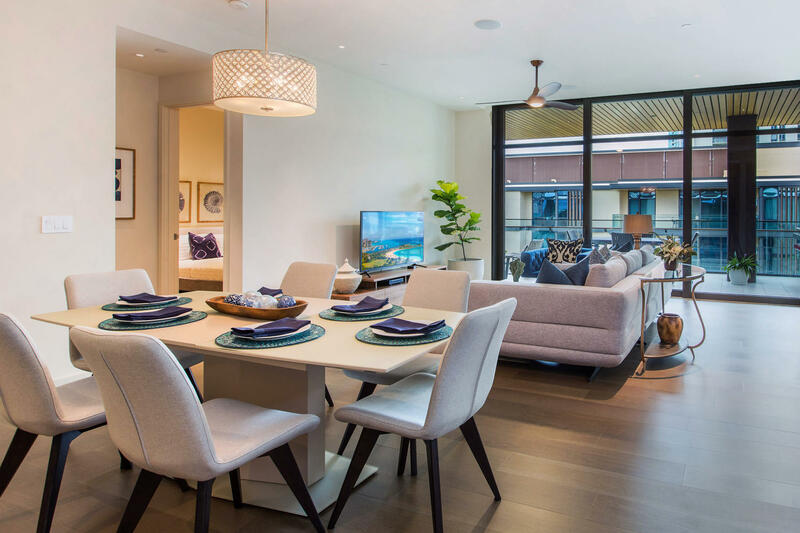 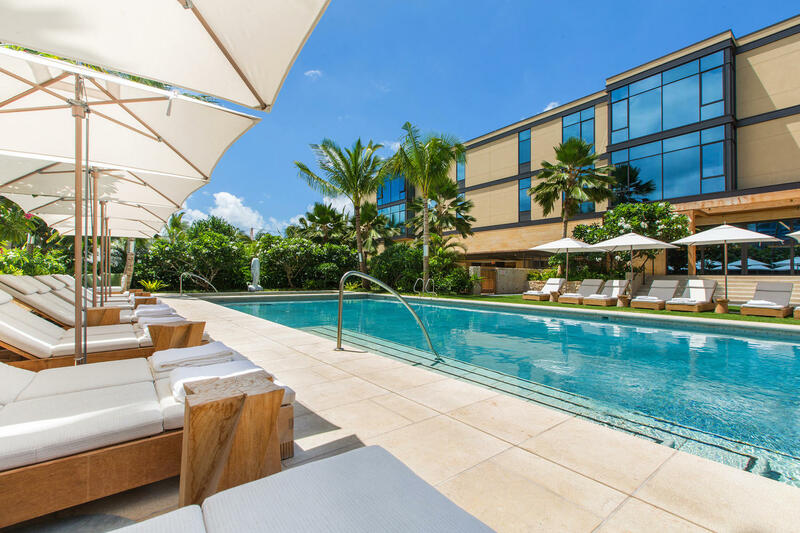 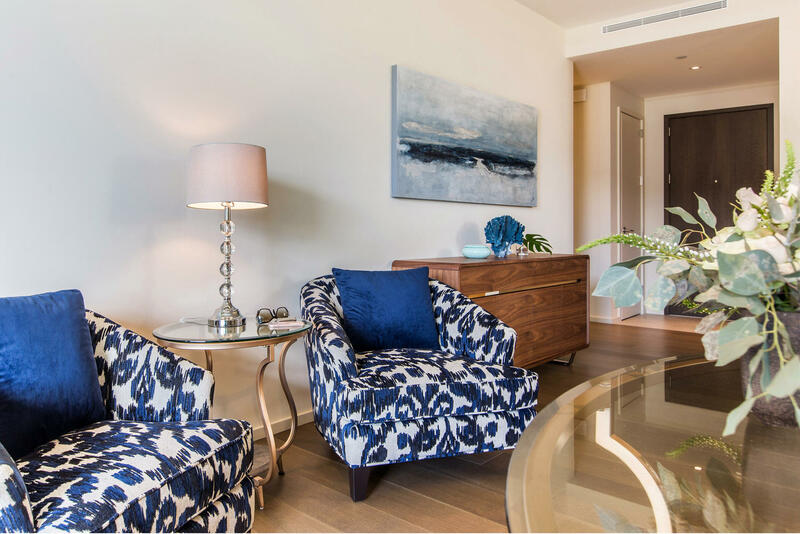 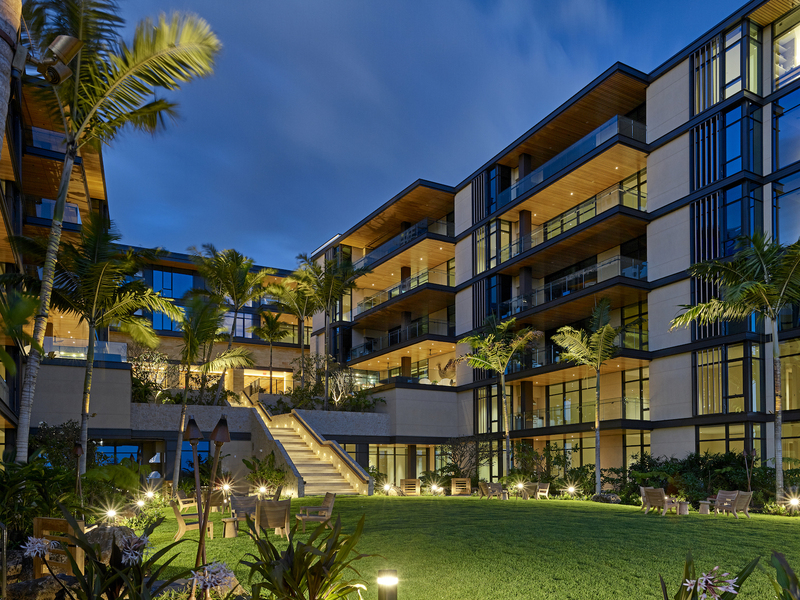 The Park Lane Sunset Resort luxury suite in Oahu’s trendy Kaka’ako neighborhood offers a premier location to experience the best of Honolulu. 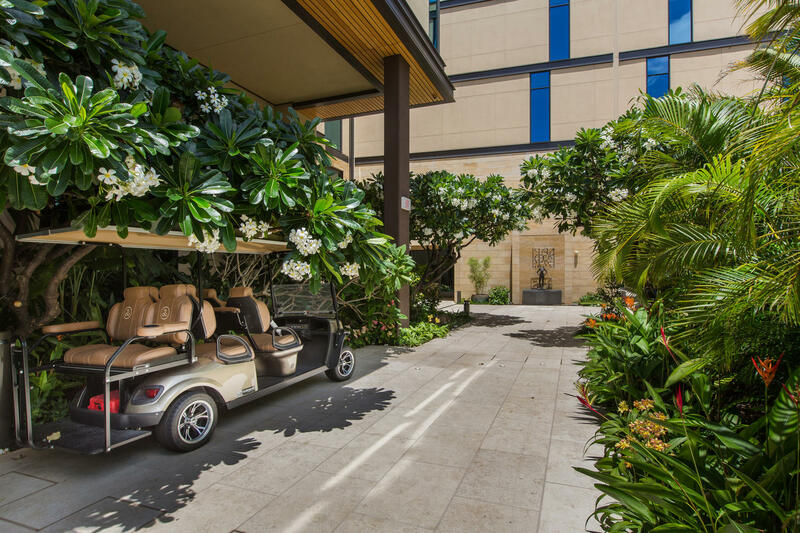 Take a relaxing stroll to Ala Moana Beach Park in the afternoon, and head out to Kaka’ako’s best nightclubs and lounges for a night out on the town. 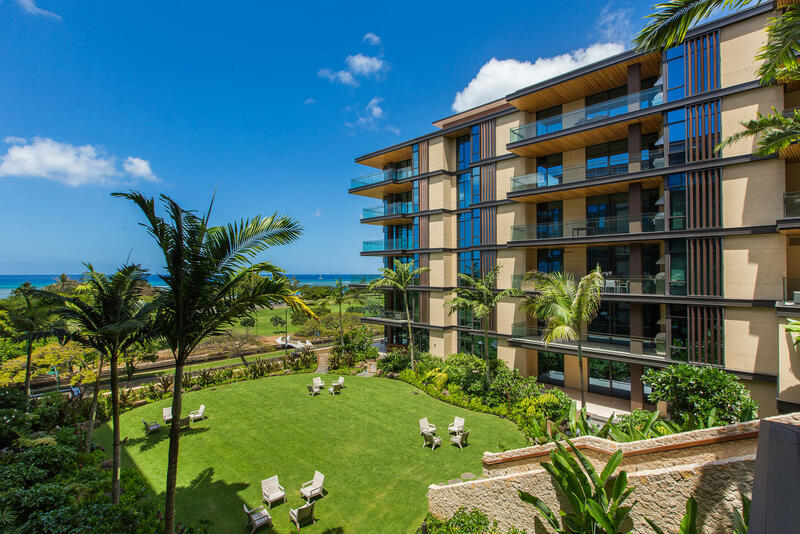 World-famous Hanauma Bay is only 13 miles away, and the iconic Diamond Head State Monument is just over six miles away, making for two exciting days of sightseeing.